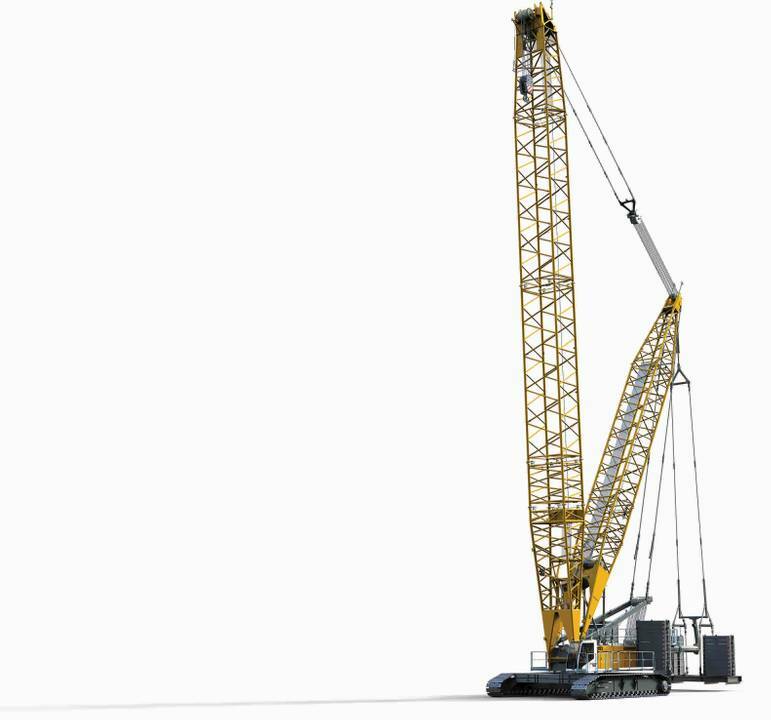 Liebherr LR 1300 SX crawler crane. Liebherr 125 K fast-erecting crane. 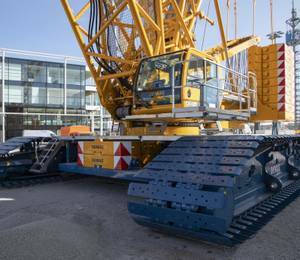 The new Liebherr LR 1300 SX crawler crane offers a maximum lifting capacity of 300 t. For heavy loads, the crane can be fitted with a derrick boom in combination with an additional counterweight. The new suspended counterweight no longer has a fixed counterweight radius and instead can be hydraulically displaced. The Liebherr ‘Boom Up-and-Down Aid’ assistance system indicates the approach to the tipping border and automatically stops operation before the operator unintentionally enters an unsafe zone. It assists the operator in leaving the danger zone without having to activate the safety bypass switch. The LR 1300 SX is fitted with wind sensors on the main boom and jib. Both the measured wind speed and the actual crane configuration (boom length and boom angle) are taken into consideration when calculating the current hazardous situation for the crane. When the conditions become too dangerous, the system gives a warning. The actual status is visible for the operator in the cabin at all times. At wind speeds of 10-16 m/s, the operator can adjust the maximum lifting capacity through a simple selection on the control panel. 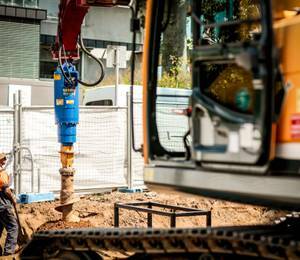 The Ground Pressure Visualisation calculates the current ground pressure of the crane in real time and compares it with the specified safety limits of the relevant position. The ground pressure is displayed in the cab and the operator knows whether the machine is situated in, or is approaching, a critical area. Three different driving speeds are available. Driving is always carried out in ‘Safe Mode’ with active Load Moment Limiter, and is dependent on the driving speed. 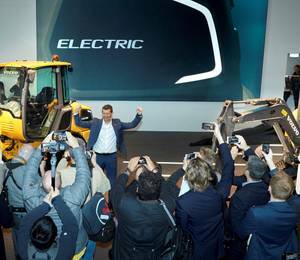 This means the Liebherr crane control system, Litronic, automatically adjusts the lifting capacities to suit the driving speed, when driving with a load on the hook. For barge operation, the lifting capacities are automatically adjusted depending on the inclination of the barge. According to Liebherr, the LR 1300 SX has been approved for personnel lifting. Thanks to the EC-type approval certificate of the Liebherr crane for the occasional lifting of persons, local approval from an acceptance authority is no longer required by the crane operator. The statutory emergency generator and emergency controls required for personnel lifting are offered by Liebherr as a simple plug-and-play solution. In case of emergencies, the crane availability can be restored within a few minutes. 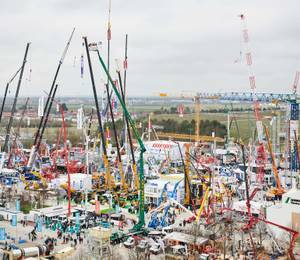 Liebherr’s new fast-erecting crane, the 125 K, offers a radius of 55 m and a maximum hook height of 65.5 m. The crane is scheduled to be available worldwide from March 2019. It is currently the largest fast-erecting crane on the market, according to Liebherr, specially developed for civil engineering requirements such as road traffic bridges and commercial as well as industrial building construction – in this field, high load capacities and large radii are usually required for projects with limited lead times. The 125 K has a considerable initial hook height of 29.5 m as standard. 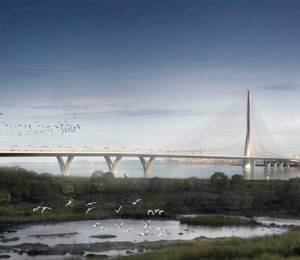 Five tower sections can be additionally inserted to reach a total hook height of 41.5 m. If the hook height still isn’t sufficient, the 30-degree luffed jib position enables an impressive 65.5 m hook height. The crane provides an 8,000 kg maximum load capacity and with a 55-m radius at the jib head, it is able to lift 1,300 kg thanks to its Load-Plus function. Its high flexibility is also demonstrated by its five radius options, ranging from 35 m to 55 m.
With its 3.2 m slewing radius, the 125 K fast-erecting crane is able to fit into small spaces. 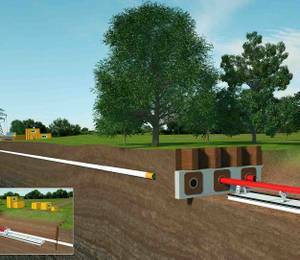 Thanks to its variable slewing radius, which can be extended to 4 m, the amount of transportable ballast can be reduced – which in turn reduces costs. 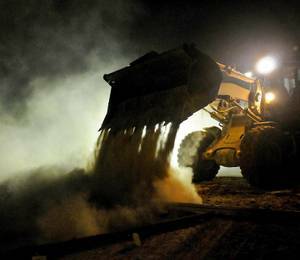 Besides familiar features such as the Micromove fine positioning mode and Liebherr’s two-line operation Speed2Lift, further improvements have also been made, including site lighting that is now available with LED floodlights to ensure better site illumination. 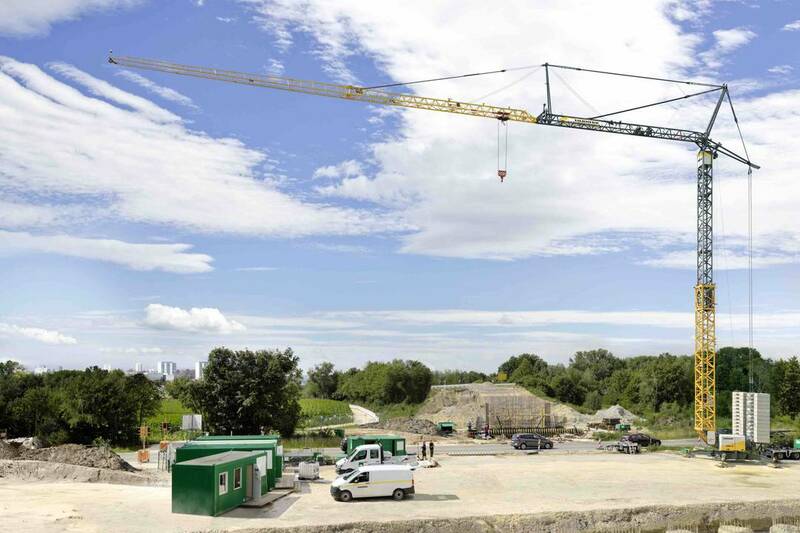 The external K-crane cabin is also available for the 125 K – which is considered an advantage for larger sites where 125 Ks are typically in action. This way, the crane operator always has the entire construction site in view. The 125 K can also be towed as a trailer by a conventional truck. 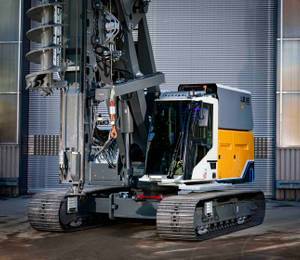 For this, Liebherr offers a new solution: the LiTRAX axle system. Liebherr has developed a new 80 km/h high-speed axle that is suitable for the current fast-erecting crane range. It can be used in a modular manner and consists of three units: a front axle as well as one rigid and one steerable rear axle. As a result, a 53 K or a 65 K.1 can be transported using the front axle and only part of the rear axle. For an 81 k.1, a tandem axle can be assembled using two individual rear axle modules. With these three units, it is possible to select the optimum combination for all Liebherr fast-erecting cranes, enabling them to be compact and flexible on site. The axle system is equipped with advanced operation safety technology such as an electronic braking system that ensures fast response when braking. The highlight, however, is the electronic stability control system. Sensors measure the lateral acceleration and detect tilting tendencies early on. Breaking intervention is specifically applied to individual tyres and the axle is stabilised. This prevents loss of control, especially in the case of unexpected braking manoeuvres or difficult weather conditions, and therefore ensures a significant increase in crane transport safety. The front axle has a steering angle of 180 degrees, that of the steered rear axle being 27.5 degrees in both directions. This makes tight manoeuvre with a small radius possible and also means that the cranes can be positioned in tight spaces.